Obama Against Terrorists as president. But in the last election, Mitt Romney was campaigning for the office of president. When ask. If he would bring bin Laden to justice? His answer, “it’s not worth it to spend billion of dollars to bring one man to justice.” This is the voice of CEO who would put capital gains above those innocent victims who lost their lives and their surviving family members on September 11, 2001. Which show the insensitivity to those families and their love ones. I would remind Mitt Romney that September 11, 2001 was an attack on the United States. This was our Pearl Harbor of the 21st century. When every we are attacked by a foreign or domestic enemy. We will never tuck our tail between our legs and lick our wounds. And say it cost too many dollars for the United States to defend its self. There is more than the lost of dollars in this attack, Mitt Romney. What price do you put on human life? Those that lost their lives in that attack were not the enemy of our enemy. They were all innocent people. We need a president that is a strong Commander-in-Chief for the security of our nation. We are not looking for a strong CEO as Commander-in-Chief who would put capital gains above the protection of the U.S. and all of its citizens. President Obama have shown that strength by bringing bin Laden to justice. Because he felt the pain of those surviving families members of September 11, 2001. Mitt Romney, the CEO is too entrenched in capital investment to be compassionate about the lost of life in times of war. To him this would just be collateral damage as job loss and capital gains for the CEO. Therefore Mitt Romney doesn’t connect with the people below CEO level. Governor Romney accuse President Obama of spiking the football after bring Osama bin Laden to justice. Mitt Romney, you can’t make those family members of September 11 2001 believe that lost of their love ones lives was a football game. Those family members cried out to bring Osama bin Laden to justice. So they could have closure for the lost of their love ones. For President Obama to bring bin Laden to justice was a strategic tactical move against Al Qaeda. Osama bin Laden who was an ideological leader that al Qaeda and the terrorists drew their inspiration from. 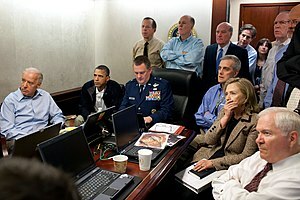 Because of President Obama bold and courageous decision to take out bin Laden. Now Al Qaeda is a group of terrorists without their inspirational leader. And al Qaeda is on the run and without a permanent base from which to use, but they are still dangerous. They want to kill Americans here in the U.S. and abroad. This is why we need a strong Commander-in-Chief in this decade and the next. Do we really need a presidential candidate who campaign as strong CEO or a strong Commander-in-Chief? You decide. Those political pundits who pretend that this war on terrorism is a football game. Is a disservice to our men and women in uniform, the pentagon, our war college and, the Commander-in-Chief. Mitt Romney haven’t shown in his six years of campaigning that he is ready to make those tough decisions as a strong Commander-in-Chief. As a presidential candidate. Obama Against Terrorists. This entry was posted in Obama and tagged commander-in-chief, family members, justice, lost, Mitt Romney, Osama bin Laden, Pearl Harbor, President Obama, September 11 2001, united states. Bookmark the permalink. Some genuinely wonderful information, Sword lily I observed this. “Traffic signals in New York are just rough guidelines.” by David Letterman.